Masale Bhath is an imperative Rice dish cooked with seasonal vegetables and spices for every festive/wedding meal in Maharashtra which is very spicy and flavourful.. 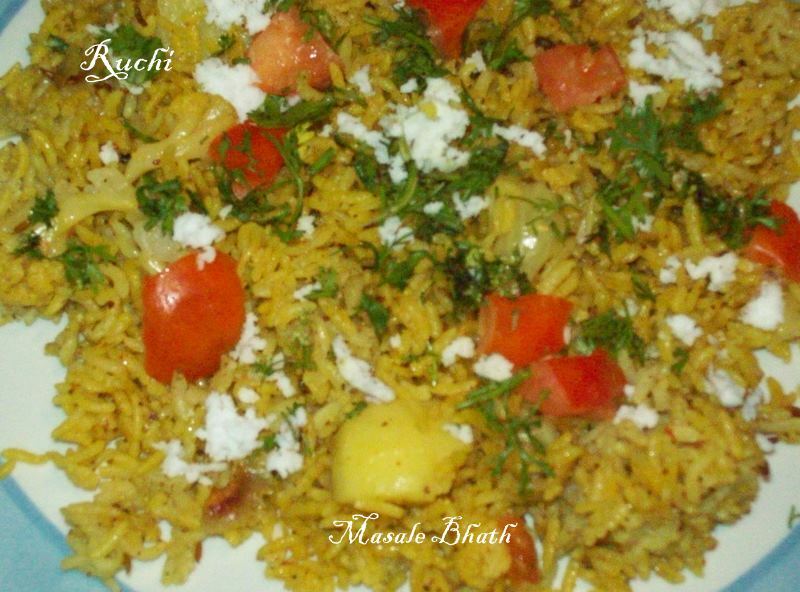 It is simple in terms of preparation, and it is an absolutely tasty dish yet so easy to make. 2. Heat ghee in a pan and season with mustard seeds and cumin seeds. When they crackle, add curry leaves, asafoetida and green chili, and onion, saute until onion changes color. 3. Add turmeric powder, red chilli powder, and the roasted masala powder, mix well for a minute. 4. Add the vegetables, salt , sprinkle some water and cook for 5 minutes. Then Add rice and mix well. 5. Bring to a boil and then reduce heat and continue to cook covered until rice is done and all the water is absorbed. 6. Remove from heat and serve hot, garnished with roasted cashewnuts, chopped coriander leaves and scraped coconut. 7. Serve hot with a raita. Woww... yummy and delicious bhath.. looks yummyyyy !! Wat a delicious and filling one pot meal,yumm! Delicious and yummy one post meal...Luks very tempting.